Steiner Promotion – Free Gear! 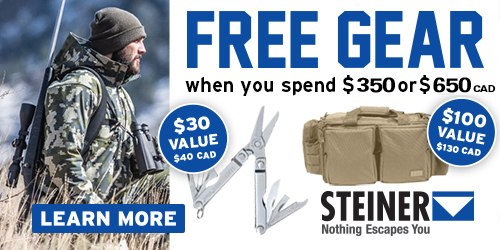 Spend at least $250 ($350 CAD) on any combination of any Steiner products and receive a FREE Leatherman Micra (value of $30 US/$40 CAD). Spend a minimum of $500 ($650 CAD) on any combination of Steiner products and receive a FREE 5.11 Range Bag (value of $100 US/$130 CAD). Canada only. Void where prohibited, taxed or otherwise restricted. • Duplicate or invalid requests will be rejected and will not be returned. all redemption materials for your records. • Valid while supplies last. Only one redemption claim per envelope, and only one claim per household. blemished sale items or eOptics products. • Forms submitted after July 31, 2019 will not be accepted.